A versatile all-purpose joint compound providing professional-grade performance. 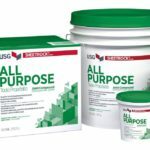 This drywall compound combines single-package convenience with good taping and topping performance. Recommended for laminating and repairing cracks in interior plaster and masonry not subject to moisture, this compound features great open time and cold bond, and has smooth and slick properties. 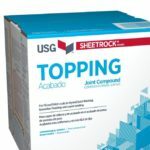 This Topping Joint Compound is a low-shrinkage compound recommended for use in second and third coats over taping and all-purpose joint compounds. Applies quickly, providing easy work-ability, excellent slip and bond, and low shrinkage. It can be used directly from the container and requires only minimal mixing, thinning, and re-tempering. This compound is unsuitable for embedding tape or for use as a first coat over metal corner trim and fastener. These joint compounds provide low shrinkage and superior bond, which make them excellent for laminating gypsum panels to gypsum panels, sound-deadening boards and above-grade concrete surfaces. They resist humidity and can be applied in damp weather allowing for same-day joint finishing and faster job completion. Available drying times: 20, 45, 90, & 210 minutes. 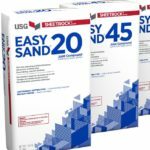 Structo-Lite Basecoat Plaster is USG’s lightest and most highly insulated basecoat plaster and is ideal for locations where an aggregate is unavailable. Just add water for a plastic working material that conforms to various designs, helping achieve durability in walls and ceilings. 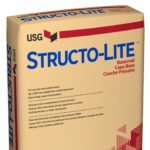 Structo-Lite® Basecoat Plaster is mill-mixed, perlite-aggregate gypsum that weighs half as much as sanded basecoat plaster and provides thermal conductivity. This all-purpose compound weighs up to 30% less than conventional-weight compounds so handling and applying are simpler, easier and faster. 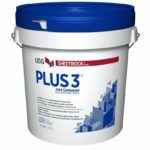 Sheetrock® Brand Plus 3® Joint Compound, offers all the benefits of conventional-weight compound but results in less shrinkage and is easy to sand. Use Sheetrock® Brand Plus 3® Joint Compound for embedding paper joint tape and finishing gypsum panel joints or simple hand-applied texturing. 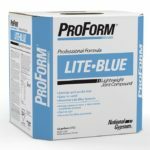 ProForm Lite-Blue Joint Compound is a vinyl base ready mix lightweight joint compound. Approximately 30% lighter than conventional ready mix, this compound pulls and sands easier, pocks less and reduces shrinkage by up to 33%. 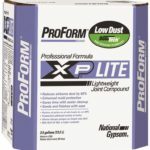 ProForm XP Lite Joint Compound with Dust-Tech is a vinyl base ready-mix joint compound specifically formulated to reduce airborne dust while sanding. A lightweight all-purpose compound that offers the same features and benefits as standard joint compound, but is 30% lighter, easier to sand, produces less airborne dust and offers enhanced mold resistance. This product was formerly known as Lite with Dust-Tech.